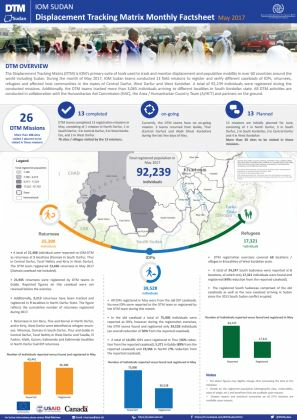 A total of 250,663 beneficiaries registered/ verified/ tracked since the beginning of 2018, in which 185,393 (48,399 IDPs, 131,958 returnees and 5,582 affected population/ vulnerable population) were properly registered, while the remaining 64,724 individuals were tracked in different locations. 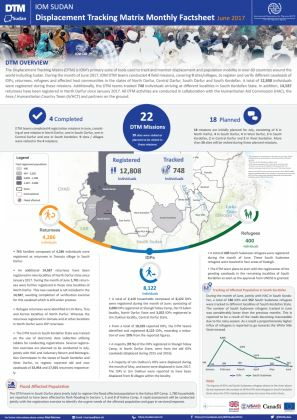 A total of 194,891 beneficiaries registered/ verified/ tracked since the beginning of 2018, in which 134,330 (21,624 IDPs and 113,454 returnees) were properly registered, while the remining 60,561 individuals were tracked in different locations. 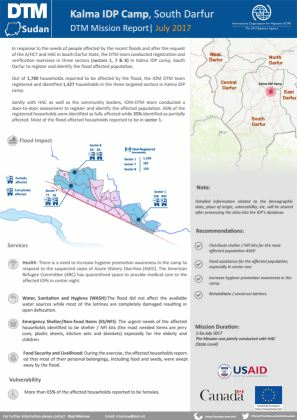 This Flow Monitoring Point (FMP) was established in Diffra, in the northern part of Abyei. 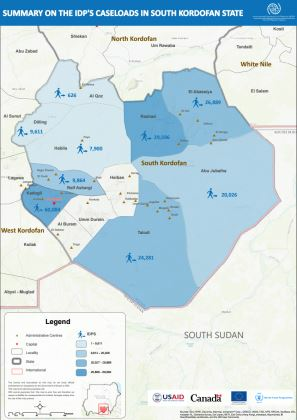 A map inicating the location of IDP populations in South Kordofan State (July 2017). 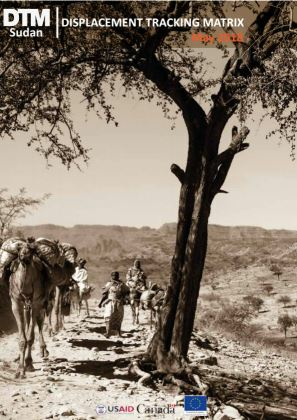 On 29 March 2017, the Kingdom of Saudi Arabia (KSA) issued an official statement declaring that all irregular migrants in the country must leave voluntarily within an established 90-day amnesty period. 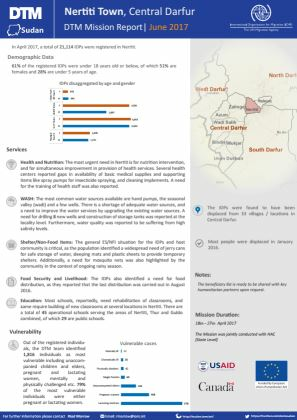 DTM registered 1,547 households consisting of 3,983 individuals in 43 locations within the two localities. 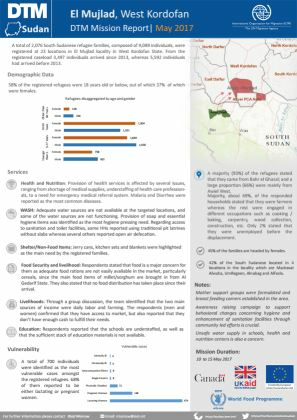 Most of the South Sudanese are living in El Nuhud locality (1,486 households consisting of 3,835 individuals), of which about 62% are male. 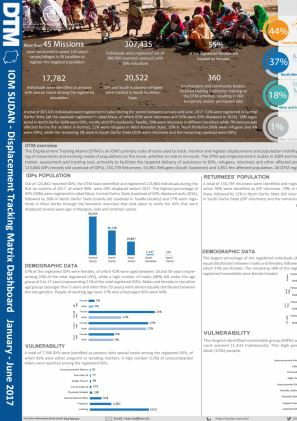 The Displacement Tracking Matrix (DTM) is IOM’s primary suite of tools used to track and monitor displacement and population mobility in over 60 countries around the world including Sudan. 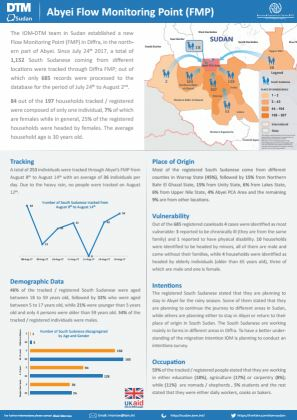 1,270 South Sudanese were reported to be living in 7 areas of El Khuwei locality namely: El Khuwei town (570 individuals), Um Lobana (340 individuals), Nasharbo (165individuals), Morkab (70 individuals), Um Awesha (35 individuals), Al Dodia (70 individuals) and Megasem Al Tahir (20 individuals). 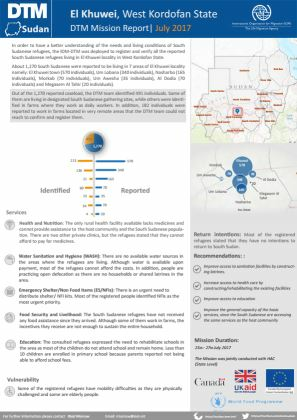 A total of 307,435 individuals were registered in Sudan during the period between January and June, 2017. 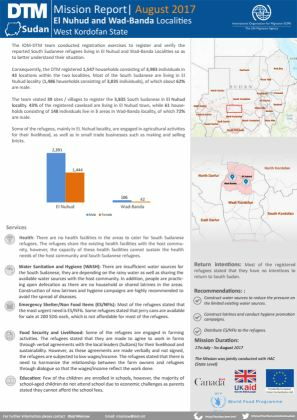 51% were registered in Central Darfur State (all the caseload registered in Jabal Mara, of which 65% were returnees and 35% were IDPs displaced in 2016). 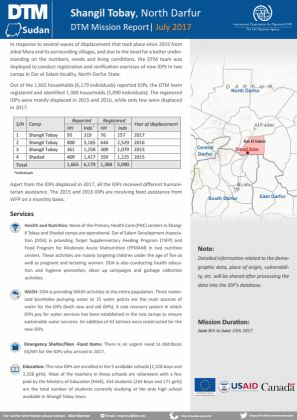 This map contains cumulative IDP figures by state. 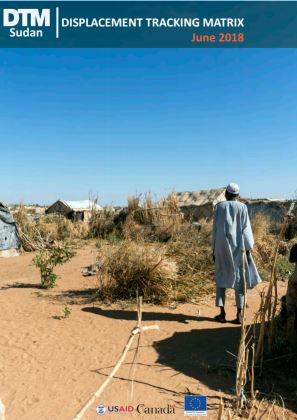 In response to the needs of people affected by the recent floods in North Darfur state, the DTM team conducted a door-to-door assessment mission in Shangil Tobay town and Um Deressaya IDP camp to assess and register the flood affected population. 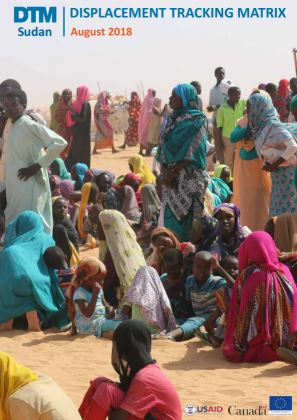 In response to the needs of people affected by the recent floods in South Darfur State, the DTM team conducted registration and verification exercises in Kalma IDP camp, South Darfur to register and identify the flood affected population. 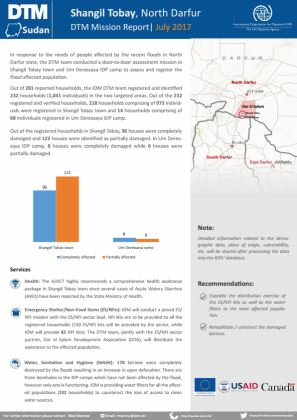 On 9 June 2017, at Korma IDP gathering site, a fire incident was reported to result in fire damage to 1,001 shelters, 5 fatalities (2 males and 3 females), and 19 casualties. 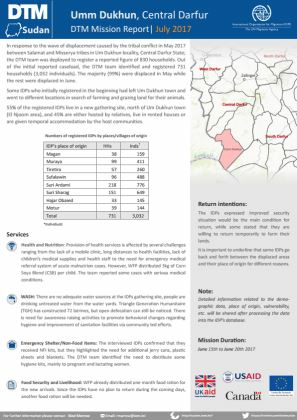 During the month of June 2017, IOM DTM teams conducted 4 field missions, covering 9 sites/villages, to register and verify different caseloads of IDPs, returnees, refugees and affected host communities in the states of North Darfur, Central Darfur, South Darfur and South Kordofan. 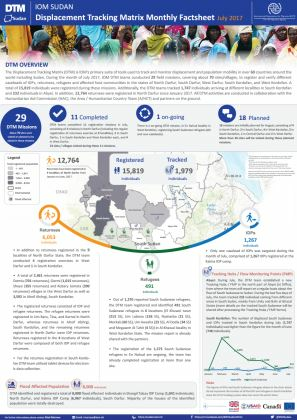 In response to the wave of displacement caused by the tribal conflict in May 2017 between Salamat and Misserya tribes in Um Dukhun locality, Central Darfur State; the DTM team was deployed to register a reported figure of 830 households. 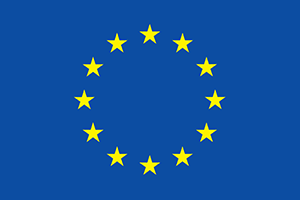 The total registered population in May 2017 was 92,239. 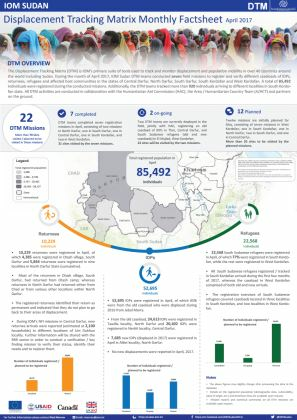 A total of 35,390 individuals were identified as returnees during the reporting period. 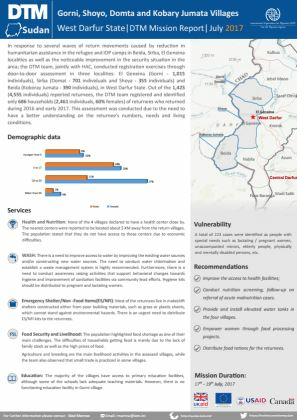 39,528 individuals were identified as IDPs and 17,321 were recorded as refugees. 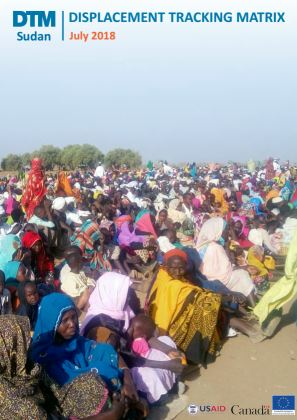 A total of 2,076 South Sudanese refugee families, composed of 9,089 individuals, were registered at 23 locations in El Mujlad locality in West Kordofan State. 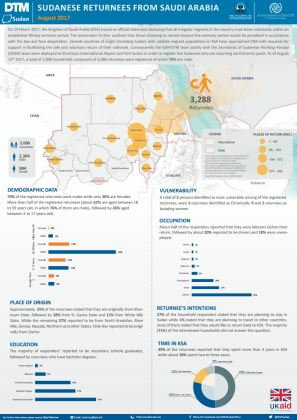 From the registered caseload 3,497 individuals arrived since 2013, whereas 5,592 individuals had arrived before 2013. 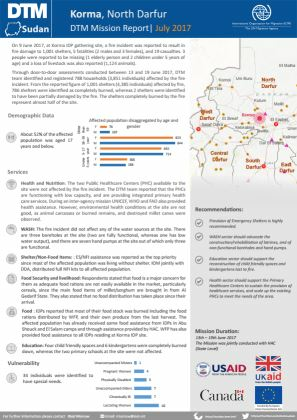 DTM Sudan registered a total population of 85,492 individuals. 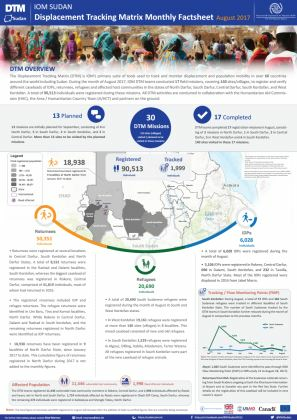 10,229 returnees were registered in April, of which 4,385 were registered in Otash village, South Darfur and 5,844 returnees were registered in nine localities in North Darfur State (cumulative).